We designed myMantra to give you a beautiful piece of jewellery that you can wear every day, to carry your mantra with you. Just catching sight of an inspiring word or phrase in the middle of a busy day or at a frustrating moment can change our mood and lift our hearts. We hope it reminds you to dream big dreams, to see all the positives in life; we hope it makes you smile, and brings you joy. Mantras originally came about as sacred words or phrases to repeat when meditating to help your mind shut out the external noises and thoughts, read your phrase to inspire and motivate you through the day. This pre-engraved mantra is one of our absolute favourites, selected by the fabulous team it carries a romantic message. 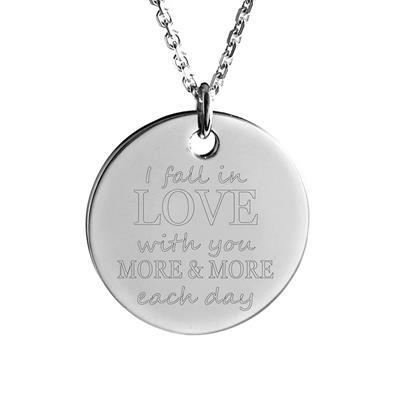 A quick glance at this necklace will remind them how much you mean to someone, the perfect romantic gift for the one you love, remind them that you fall in love with them more and more each day.